River Kwae Peace Temple as mentioned in "The Railway Man"
On my first visit to Kanchanaburi in November 2013, I took a picture of the River Kwae Peace Temple, but had no idea of its meaning and significance. For those that have watched the movie, or read the book, titled The Railway Man by Eric Lomax, this is the peace memorial that was mentioned in the movie. It was constructed primarily as a result of the support of Nagase Takashi, the Japanese interpreter that was featured in the movie. 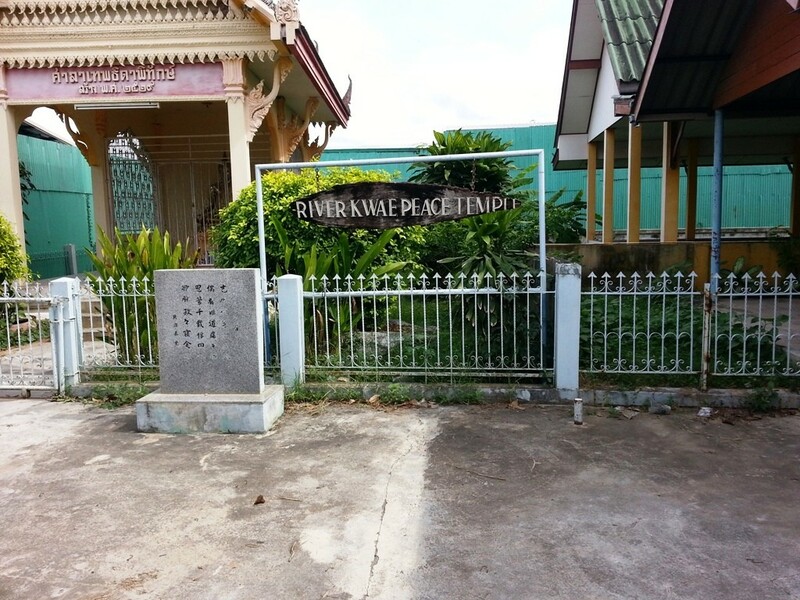 It was erected in 1986 by The River Kwai Peace Foundation. On my recent visit to the area, for the Anzac Day Dawn Service of 2016, I took some additional photos. The images below show Brian Martin, the son of POW Leslie Martin. Leslie worked in the Hellfire Pass and Hammer ‘n Tap Cuttings with Colonel Sir Ernest Edward “Weary” Dunlop during the second world war. Leslie survived the ordeal and returned home to Australia. He married his sweetheart Kate, and fathered four sons. Leslie’s Wife Kate has attended the Anzac Day Dawn Service at Hellfire Pass on two occasions and is still in good health. Three of his sons, and their wives, also accompanied us to the Hellfire Pass Dawn Service on Anzac Day 2015. Other than some mentions relating to the movie and book there, is not a lot of detailed information available on the internet regarding the River Kwae Peace Temple. When in Thailand you will often get spelling variations in place names. For this post I have used Kwae as that is what in on the sign, however it is most commonly referred to in the western world as River Kwai. Not wanting to get too technical here, but River Kwai is not the real name either. In 1960 the river was renamed from the Mae Klong to Khwae Yai after the release of the blockbuster movie titled The Bridge on The River Kwai. You can visit the Facebook page of The River Kwai Peace Foundationer but it is written mostly in Japanese. Although it is called a temple, it should be called a shrine. 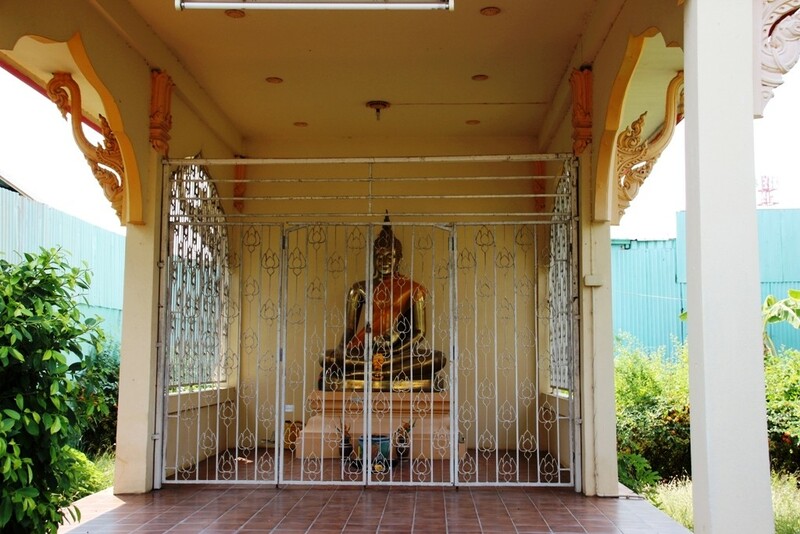 To officially be a Buddhist Temple, it requires a resident monk. 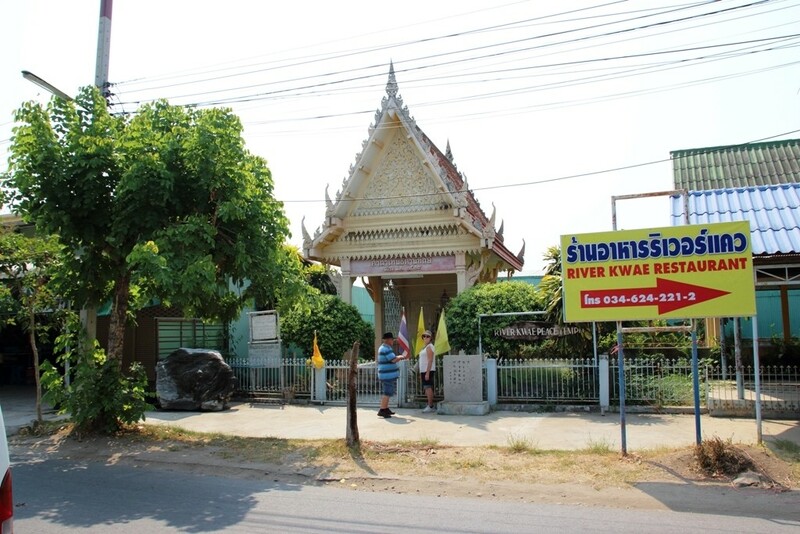 Finding the River Kwai Peace Temple can be a little difficult as many people do not know about it. However, as with most things, it is easy when you have seen it before. It is directly opposite the River Kwai Bridge station. If you have this page open on your mobile device, simply click view larger map and let Google take you there.